Analysis of the trauma literature has shown that 50% of all trauma deaths are secondary to traumatic brain injury (TBI), and gunshot wounds to the head caused 35% of these. The current increase in firearm-related violence and subsequent increase in penetrating head injury remains of concern to neurosurgeons in particular and to the community as a whole. 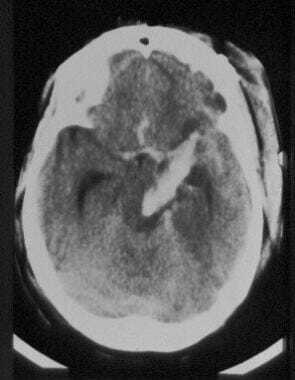 The CT scan below is of a patient after a gunshot wound to the brain. A young man arrived in the emergency department after experiencing a gunshot wound to the brain. The entrance was on the left occipital region. A CT scan shows the skull fracture and a large underlying cerebral contusion. The patient was taken to the operating room for debridement of the wound and skull fracture, with repair of the dura mater. He was discharged in good neurological condition, with a significant visual field defect. The definition of a penetrating head trauma is a wound in which a projectile breaches the cranium but does not exit it. Despite the prevalence of these injuries, the morbidity and mortality of penetrating head injury remains high. Improvements in the understanding of the mechanisms of injury and aggressive medical and surgical management of patients with these injuries may lead to improved outcomes. This chapter focuses on the pathophysiology of both primary and secondary mechanisms of injury, describes the treatment of patients from presentation to discharge, and concludes with a discussion of possible complications and patient outcome. For excellent patient education resources, visit eMedicineHealth's Brain and Nervous System Center. Also, see eMedicineHealth's patient education article Brain Infection. The earliest reported series of head injuries and their management appears in the Edwin Smith papyrus around 1700 BC, reporting 4 depressed skull fractures treated by the Egyptians by leaving the wound unbandaged, providing free drainage of the intracranial cavity, and anointing the scalp wound with grease. Hippocrates (460-357 BC) performed trephination for contusions, fissure fractures, and skull indentations. Galen's experience in 130-210 AD treating wounded gladiators led to recognition of a correlation between the side of injury and the side of motor loss. During the Dark Ages, little progress was made in the surgical management of head wounds and medicine continued to hold a pessimistic view of head wounds with torn dura mater. In the 17th century, Richard Wiseman provided a better understanding of surgical management of penetrating brain injuries; he recommended the evacuation of subdural hematomas and the extraction of bone fragments. In his experience, deep wounds had a much worse prognosis than superficial ones. Major advances in the management of penetrating craniocerebral injuries in the mid-19th century were related to the work of Louis Pasteur (1867), Robert Koch in bacteriology (1876), and Joseph Lister in asepsis (1867). Such advances dramatically reduced the incidence of local and systemic infections, as well as mortality. A dramatic increase in the incidence of penetrating injuries to the brain has occurred,  with gunshot wounds to the head becoming the leading or second leading cause of head injury in many cities in the United States. [4, 5, 3] These injuries are devastating to the patient, family, and society. Siccardi et al prospectively studied a series of 314 patients with craniocerebral missile wounds and found that 73% of the victims died at the scene, 12% died within 3 hours of injury, and 7% died later, yielding a total mortality of 92% in his series. In another study, gunshot wounds were responsible for at least 14% of the head injury-related deaths from 1979-1986. Penetrating head injuries can be the result of numerous intentional or unintentional events, including missile wounds, stab wounds, and motor vehicle or occupational accidents (nails, screwdrivers). The pathological consequences of penetrating head wounds depend on the circumstances of the injury, including the properties of the weapon or missile, the energy of the impact, and the location and characteristics of the intracranial trajectory. Following the primary injury or impact, secondary injuries may develop. Secondary injury mechanisms are defined as pathological processes that occur after the time of the injury and adversely affect the ability of the brain to recover from the primary insult. A biochemical cascade begins when a mechanical force disrupts the normal cell integrity, producing the release of numerous enzymes, phospholipids, excitatory neurotransmitters (glutamate), Ca, and free oxygen radicals that propagate further cell damage. Missiles range from low-velocity bullets used in handguns, as shown in the image below, or shotguns to high-velocity metal-jacket bullets fired from military weapons. [14, 15] Low-velocity civilian missile wounds occur from air rifle projectiles, nail guns used in construction devices, stun guns used for animal slaughter, and shrapnel produced during explosions. Bullets can cause damage to brain parenchyma through 3 mechanisms: (1) laceration and crushing, (2) cavitation, and (3) shock waves. The injury may range from a depressed fracture of the skull resulting in a focal hemorrhage to devastating diffuse damage to the brain. A 65-year-old man experienced a gunshot wound to the right frontoparietal region. 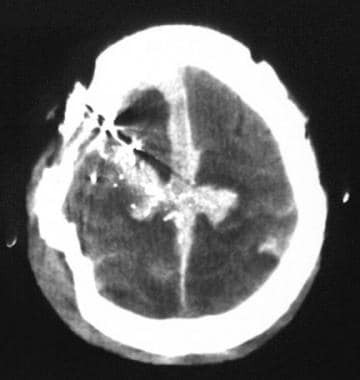 A CT scan shows that the bullet crossed the midline, lacerated the superior longitudinal sinus, and produced a large midline subdural hematoma. The patient presented with a Glasgow Coma Scale (GCS) score of 4 and died. In missile wounds, the amount of damage to the brain depends on numerous factors including (1) the kinetic energy imparted, (2) the trajectory of the missile and bone fragments through the brain, (3) intracranial pressure (ICP) changes at the moment of impact, and (4) secondary mechanisms of injury. The kinetic energy is calculated employing the formula 1/2mv2, where m is the bullet mass and v is the impact velocity. At the time of impact, injury is related to (1) the direct crush injury produced by the missile, (2) the cavitation produced by the centrifugal effects of the missile on the parenchyma, and (3) the shock waves that cause a stretch injury. As a projectile passes through the head, tissue is destroyed and is either ejected out of the entrance or exit wounds or compressed into the walls of the missile tract. This creates both a permanent cavity that is 3-4 times larger than the missile diameter and a pulsating temporary cavity that expands outward. The temporary cavity can be as much as 30 times larger than the missile diameter and causes injury to structures a considerable distance from the actual missile tract. This group of wounds, example depicted below, represents a smaller fraction of penetrating head injuries. The causes may be from knives, nails, spikes, forks, scissors, and other assorted objects. Penetrations most commonly occur in the thin bones of the skull, especially in the orbital surfaces and the squamous portion of the temporal bone. The mechanisms of neuronal and vascular injury caused by cranial stab wounds may differ from those caused by other types of head trauma. Unlike missile injuries, no concentric zone of coagulative necrosis caused by dissipated energy is present. Unlike motor vehicle accidents, no diffuse shearing injury to the brain occurs. A CT scan of a young female who presented to the emergency department with a stab wound to the head produced by a large knife shows the extent of intracranial damage, which affects midline structures. The local variations in thickness and strength of the skull and the angle of the impact determine the severity of the fracture and injury to the brain, as shown below. Impacts striking the skull at nearly perpendicular angles may cause bone fragments to travel along the same trajectory as the penetrating object, to shatter the skull in an irregular pattern, or to produce linear fractures that radiate away from the entry defect. Grazing or tangential impacts produce complex single defects with both internal and external beveling of the skull, with varied degrees of brain damage. Lateral skull x-ray film of a patient who presented with a severe intracranial injury produced by a golf club. The patient presented to the emergency department with a golf club in his head. The club was removed in the operating room. The clinical condition of the patient depends mainly on the mechanism (velocity, kinetic energy), anatomical location of the lesions, and associated injuries. These can occur alone or in combination and constitute a common and treatable source of morbidity and mortality resulting from brain shift, brain swelling, cerebral ischemia, and elevated ICP. Patients present with the signs and symptoms of an expanding intracranial mass, and the clinical course varies according to the location and rate of accumulation of the hematoma. The classic clinical picture of epidural hematomas is described as involving a lucid interval following the injury; the patient is stunned by the blow, recovers consciousness, and lapses into unconsciousness as the clot expands. Most traumatic epidural hematomas become rapidly symptomatic with progression to coma. Acute subdural hematoma occurs in association with high rates of acceleration and deceleration of the head that takes place at the time of trauma. This remains one of the most lethal of all head injuries because the impact causing acute subdural hematoma commonly results in associated severe parenchymal brain injuries. These result from direct rupture of small vessels within the parenchyma at the moment of impact. Patients typically present with a focal neurological deficit related to the location of the hematoma or with signs of mass effect and increased ICP. The occurrence of delayed traumatic intracerebral hematomas is well documented in the literature. The time interval for the development of delayed intracerebral hematomas ranges from hours to days. Although these lesions may develop in areas of previously demonstrated contusion, they frequently occur in the presence of completely normal results on the initial computed tomography (CT) scan. Patients with this diagnosis typically meet the following criteria: (1) a definite history of trauma, (2) an asymptomatic interval, and (3) an apoplectic event with sudden clinical deterioration. These consist of areas of perivascular hemorrhage about small blood vessels and necrotic brain. Typically, they assume a wedgelike shape, extending through the cortex to the white matter. When the pia-arachnoid layer is torn, the injury is termed a cerebral laceration. Clinically, cerebral contusions serve as niduses for delayed hemorrhage and brain swelling, which can cause clinical deterioration and secondary brain injury. This type of hemorrhage usually is a result of various forces that produce stress sufficient to damage superficial vascular structures running in the subarachnoid space. Traumatic subarachnoid hemorrhage may predispose to cerebral vasospasm and diminished cerebral blood flow, thereby increasing morbidity and mortality as a result of secondary ischemic damage. This has become recognized as one of the most important forms of primary injury to the brain. In the most extreme form, patients present with immediate prolonged unconsciousness from the moment of injury and subsequently remain vegetative or severely impaired. A critical factor in early treatment decisions and in long-term outcome after penetrating head injuries is the patient's initial level of consciousness. Although many methods of defining level of consciousness exist, the most widely used measure is the Glasgow Coma Scale (GCS) introduced by Teasdale and Jennett. Minor or mild injury includes those patients with an initial level of 13-15. Moderate injury includes patients with a score of 9-12. Severe injury refers to a postresuscitation level of 3-8 or a subsequent deterioration to 8 or less. Patients with severe head injury typically fulfill the criteria for coma, have the highest incidence of intracranial mass lesions, and require intensive medical and, often, surgical intervention. Penetrating objects to the cranium must traverse through the scalp, through the skull bones, and through the dura mater before reaching the brain. The scalp consist of 5 different anatomical layers that include the skin (S); the subcutaneous tissue (C); the galea aponeurotica (A), which is continuous with the musculoaponeurotic system of the frontalis, occipitalis, and superficial temporal fascia; underlying loose areolar tissue (L); and the skull periosteum (P). The subcutaneous layer possesses a rich vascular supply that contains an abundant communication of vessels that can result in a significant blood loss when the scalp is lacerated. The relatively poor fixation of the galea to the underlying periosteum of the skull provides little resistance to shear injuries that can result in large scalp flaps or so-called scalping injuries. This layer also provides little resistance to hematomas or abscess formation, and extensive fluid collections related to the scalp tend to accumulate in the subgaleal plane. The bones of the calvaria have 3 distinct layers in the adult—the hard internal and external tables and the cancellous middle layer, or diploë. Although the average thickness is approximately 5 mm, the thickest area is usually the occipital bone and the thinnest is the temporal bone. The calvaria is covered by periosteum on both the outer and inner surfaces. On the inner surface, it fuses with the dura to become the outer layer of the dura. Aesthetically, the frontal bone is the most important because only a small portion of the frontal bone is covered by hair. In addition, it forms the roof and portions of the medial and lateral walls of the orbit. Displaced frontal fractures therefore may cause significant deformities, exophthalmus, or enophthalmos. The frontal bone also contains the frontal sinuses, which are paired cavities located between the inner and outer lamellae of the frontal bone. The lesser thickness of the anterior wall of the frontal sinus makes this area more susceptible to fracture than the adjacent tempora-orbital areas. The dura mater or pachymeninx is the thickest and most superficial meninx. It consists of 2 layers—a superficial layer that fuses with the periosteum and a deeper layer. In the same region between both layers, large venous compartments or sinuses are present. A laceration through these structures can produce significant blood loss or be responsible for producing epidural or subdural hematomas. Sosin DM, Sacks JJ, Smith SM. Head injury-associated deaths in the United States from 1979 to 1986. JAMA. 1989 Oct 27. 262(16):2251-5. [Medline]. Thurman D, Guerrero J. Trends in hospitalization associated with traumatic brain injury. JAMA. 1999 Sep 8. 282(10):954-7. [Medline]. Murano T, Mohr AM, Lavery RF, et al. Civilian craniocerebral gunshot wounds: an update in predicting outcomes. Am Surg. 2005 Dec. 71(12):1009-14. [Medline]. Grahm TW, Williams FC Jr, Harrington T, Spetzler RF. Civilian gunshot wounds to the head: a prospective study. Neurosurgery. 1990 Nov. 27(5):696-700; discussion 700. [Medline]. Benzel EC, Day WT, Kesterson L, et al. Civilian craniocerebral gunshot wounds. Neurosurgery. 1991 Jul. 29(1):67-71; discussion 71-2. [Medline]. Siccardi D, Cavaliere R, Pau A, Lubinu F, Turtas S, Viale GL. Penetrating craniocerebral missile injuries in civilians: a retrospective analysis of 314 cases. Surg Neurol. 1991 Jun. 35(6):455-60. [Medline]. Levy ML, Masri LS, Lavine S, Apuzzo ML. Outcome prediction after penetrating craniocerebral injury in a civilian population: aggressive surgical management in patients with admission Glasgow Coma Scale scores of 3, 4, or 5. Neurosurgery. 1994 Jul. 35(1):77-84; discussion 84-5. [Medline]. Bizhan A, Mossop C, Aarabi JA. Surgical management of civilian gunshot wounds to the head. Handb Clin Neurol. 2015. 127:181-93. [Medline]. Paiva WS, de Andrade AF, Amorim RL, Figueiredo EG, Teixeira MJ. Brainstem injury by penetrating head trauma with a knife. Br J Neurosurg. 2012 Oct. 26(5):779-81. [Medline]. De Villiers JC. Stab wounds of the brain and skull. Vinken PJ, Bruyn GW, eds. Handbook of clinical neurology. New York, NY: Elsevier Science Publishing; 1975. Vol 23: 407-503. Kumar R, Kumar R, Mallory GW, Jacob JT, Daniels DJ, Wetjen NM, et al. Penetrating head injuries in children due to BB and pellet guns: a poorly recognized public health risk. J Neurosurg Pediatr. 2015 Oct 23. 1-7. [Medline]. Folio L, Solomon J, Biassou N, et al. Semi-automated trajectory analysis of deep ballistic penetrating brain injury. Mil Med. 2013 Mar. 178(3):338-45. [Medline]. Stuehmer C, Blum KS, Kokemueller H, et al. Influence of different types of guns, projectiles, and propellants on patterns of injury to the viscerocranium. J Oral Maxillofac Surg. 2009 Apr. 67(4):775-81. [Medline]. Kazemi H, Hashemi-Fesharaki S, Razaghi S, et al. Intractable epilepsy and craniocerebral trauma: analysis of 163 patients with blunt and penetrating head injuries sustained in war. Injury. 2012 Dec. 43(12):2132-5. [Medline]. Aarabi B. History of the management of craniocerebral wounds. Aarabi B, Kaufman HH, Dagi TF, George ED, Levy ML, eds. Missile Wounds of the Head and Neck. Park Ridge, Ill: American Association of Neurological Surgeons; 1999. Vol 1: 281-292. Aarabi B, Tofighi B, Kufera JA, Hadley J, Ahn ES, Cooper C, et al. Predictors of outcome in civilian gunshot wounds to the head. J Neurosurg. 2014 May. 120 (5):1138-46. [Medline]. Bodanapally UK, Krejza J, Saksobhavivat N, Jaffray PM, Sliker CW, Miller LA, et al. Predicting arterial injuries after penetrating brain trauma based on scoring signs from emergency CT studies. Neuroradiol J. 2014 Apr. 27 (2):138-45. [Medline]. Bodanapally UK, Shanmuganathan K, Boscak AR, Jaffray PM, Van der Byl G, Roy AK, et al. Vascular complications of penetrating brain injury: comparison of helical CT angiography and conventional angiography. J Neurosurg. 2014 Nov. 121 (5):1275-83. [Medline]. Kaufman HH, Timberlake G, Voelker J, Pait TG. Medical complications of head injury. Med Clin North Am. 1993 Jan. 77(1):43-60. [Medline]. Hida K, Tsuda E, Sato H, Rai M, Imai T. [Brain abscess discovered 38 years after head injury (author's transl)]. No Shinkei Geka. 1978 Aug. 6(8):811-3. [Medline]. Ley EJ, Srour MK, Clond MA, et al. Diabetic patients with traumatic brain injury: insulin deficiency is associated with increased mortality. J Trauma. 2011 May. 70(5):1141-4. [Medline]. Kaufman HH, Schwab K, Salazar AM. A national survey of neurosurgical care for penetrating head injury. Surg Neurol. 1991 Nov. 36(5):370-7. [Medline]. Nakase-Richardson R, McNamee S, Howe LL, et al. Descriptive Characteristics and Rehabilitation Outcomes in Active Duty Military Personnel and Veterans With Disorders of Consciousness With Combat- and Noncombat-Related Brain Injury. Arch Phys Med Rehabil. 2013 Jun 26. [Medline]. Aarabi B. Causes of infections in penetrating head wounds in the Iran-Iraq War. Neurosurgery. 1989 Dec. 25(6):923-6. [Medline]. Aarabi B. Surgical outcome in 435 patients who sustained missile head wounds during the Iran-Iraq War. Neurosurgery. 1990 Nov. 27(5):692-5; discussion 695. [Medline]. Aarabi B. Traumatic aneurysms of brain due to high velocity missile head wounds. Neurosurgery. 1988 Jun. 22(6 Pt 1):1056-63. [Medline]. American College of Surgeons. Advanced Trauma Life Support Guidelines. Advanced Trauma Life Support Course. American College of Surgeons. 1999. Annegers JF, Hauser WA, Coan SP, Rocca WA. A population-based study of seizures after traumatic brain injuries. N Engl J Med. 1998 Jan 1. 338(1):20-4. [Medline]. Ardill W, Gidado S. Penetrating head wound: a remarkable case. Surg Neurol. 2003 Aug. 60(2):120-3; discussion 123. [Medline]. Bartholomew BJ, Poole C, Tayag EC. Unusual transoral penetrating injury of the foramen magnum: case report. Neurosurgery. 2003 Oct. 53(4):989-91; discussion 991. [Medline]. Berjano R, Vinas FC, Dujovny M. A review of dural substitutes used in neurosurgery. Crit Rev Neurosurg. 1999 Jul 28. 9(4):217-222. [Medline]. Breased JH. The Edwin Smith Surgical Papyrus. The Edwin Smith Surgical Papyrus. Chicago, Ill: University of Chicago Press; 1930. Vol 1: 165-166. Camuscu H, Dujovny M, Abd el-Bary T, Beristain X, Vinas FC. Microanatomy of the perforators of the anterior communicating artery complex. Neurol Res. 1997 Dec. 19(6):577-87. [Medline]. Centers for Disease Control. Traumatic brain injury--Colorado, Missouri, Oklahoma, and Utah, 1990-1993. MMWR Morb Mortal Wkly Rep. 1997 Jan 10. 46(1):8-11. [Medline]. Chesnut RM, Marshall LF, Marshall SB. Medical management of intracranial pressure. Cooper PR, ed. Head Injury. 3rd ed. Baltimore, Md: Williams & Wilkins; 1993. 225-246. Coplin WM, Cullen NK, Policherla PN, et al. Safety and feasibility of craniectomy with duraplasty as the initial surgical intervention for severe traumatic brain injury. J Trauma. 2001 Jun. 50(6):1050-9. [Medline]. Cosar A, Gonul E, Kurt E, et al. Craniocerebral gunshot wounds: results of less aggressive surgery and complications. Minim Invasive Neurosurg. 2005 Apr. 48(2):113-8. [Medline]. Cosar A, Gonul E, Kurt E, Gonul M, Tasar M, Yetiser S. Craniocerebral gunshot wounds: results of less aggressive surgery and complications. Minim Invasive Neurosurg. 2005 Apr. 48(2):113-8. [Medline]. Cox MW, Whittaker DR, Martinez C, Fox CJ, Feuerstein IM, Gillespie DL. Traumatic pseudoaneurysms of the head and neck: early endovascular intervention. J Vasc Surg. 2007 Dec. 46(6):1227-33. [Medline]. Dagi TF, Meyer FB, Poletti CA. The incidence and prevention of meningitis after basilar skull fracture. Am J Emerg Med. 1983 Nov. 1(3):295-8. [Medline]. Erdogan E, Izci Y, Gonul E, et al. Ventricular injury following cranial gunshot wounds: clinical study. Mil Med. 2004 Sep. 169(9):691-5. [Medline]. Feldman Z, Narayan RK, Robertson CS. Secondary insults associated with severe closed head injury. Contemporary Neurosurgery. 1992. 14:1-8. Giannotta SL, Gruen P. Vascular complications of head trauma. Barrow DL, ed. Complications and sequelae of head injury. Park Ridge, Ill: American Association of Neurological Surgeons; 1992. 31-49. Goldstein M. Traumatic brain injury: a silent epidemic. Ann Neurol. 1990 Mar. 27(3):327. [Medline]. Gonzalez-Cruz J, Cardenas R, Nanda A. Penetrating orbitocranial injury to the sella: case report and review of the literature. J La State Med Soc. 2007 Nov-Dec. 159(6):310, 312, 314. [Medline]. Gray J, Molloy D, Jenkins MG. "Glass in a scalp laceration": an unusual case of penetrating head injury presenting to the emergency department. Eur J Emerg Med. 2004 Apr. 11(2):117-8. [Medline]. Harris ME, Barrow D. Traumatic carotid-cavernous fistulas. Barrow DL, ed. Complications and sequelae of head injury. Park Ridge, Ill: American Association of Neurological Surgeons; 1992. 13-30. Hoffmann B, Sepehrnia A. Taylored implants for alloplastic cranioplasty--clinical and surgical considerations. Acta Neurochir Suppl. 2005. 93:127-9. [Medline]. Izci Y, Kayali H, Daneyemez M, et al. Comparison of clinical outcomes between anteroposterior and lateral penetrating craniocerebral gunshot wounds. Emerg Med J. 2005 Jun. 22(6):409-10. [Medline]. Izci Y, Kayali H, Daneyemez M, Koksel T, Cerrahoglu K. The clinical, radiological and surgical characteristics of supratentorial penetrating craniocerebral injuries: a retrospective clinical study. Tohoku J Exp Med. 2003 Sep. 201(1):39-46. [Medline]. Jandial R, Reichwage B, Levy M, Duenas V, Sturdivan L. Ballistics for the neurosurgeon. Neurosurgery. 2008 Feb. 62(2):472-80; discussion 480. [Medline]. Knightly JJ, Pulliam MW. Military head injuries. Narayan R, Wilberger J, Povlishock J, eds. Neurotrauma. New York, NY: McGraw Hill; 1996. Koçak A, OZer MH. Intracranial migrating bullet. Am J Forensic Med Pathol. 2004 Sep. 25(3):246-50. [Medline]. Kriet JD, Stanley RB Jr, Grady MS. Self-inflicted submental and transoral gunshot wounds that produce nonfatal brain injuries: management and prognosis. J Neurosurg. 2005 Jun. 102(6):1029-32. [Medline]. Martin EM, Lu WC, Helmick K, French L, Warden DL. Traumatic brain injuries sustained in the Afghanistan and Iraq wars. Am J Nurs. 2008 Apr. 108(4):40-7; quiz 47-8. [Medline]. Muizelaar JP, Marmarou A, Ward JD, et al. Adverse effects of prolonged hyperventilation in patients with severe head injury: a randomized clinical trial. J Neurosurg. 1991 Nov. 75(5):731-9. [Medline]. Nelson TJ, Wall DB, Stedje-Larsen ET, et al. Predictors of mortality in close proximity blast injuries during Operation Iraqi Freedom. J Am Coll Surg. 2006 Mar. 202(3):418-22. [Medline]. Nicol A. Gunshot wounds. S Afr J Surg. 2005 Nov. 43(4):150, 152. [Medline]. Pepe PE, Dutton RP, Fowler RL. Preoperative resuscitation of the trauma patient. Curr Opin Anaesthesiol. 2008 Apr. 21(2):216-21. [Medline]. Perez-Arjona E, Dujovny M, Vinas F, et al. CNS child abuse: epidemiology and prevention. Neurol Res. 2002 Jan. 24(1):29-40. [Medline]. Phillips ED. Greek Medicine. London, UK: Thames & Hudsen; 1973. Price DJ, Sleigh JD. Control of infection due to Klebsiella aerogenes in a neurosurgical unit by withdrawal of all antibiotics. Lancet. 1970 Dec 12. 2(7685):1213-5. [Medline]. Ratiu P, Talos IF, Haker S, et al. The tale of Phineas Gage, digitally remastered. J Neurotrauma. 2004 May. 21(5):637-43. [Medline]. Rezai AR, Lee M, Kite C, Smyth D, Jafar JJ. Traumatic posterior cerebral artery aneurysm secondary to an intracranial nail: case report. Surg Neurol. 1994 Oct. 42(4):312-5. [Medline]. Rosenberg WS, Harsh GR. Penetraing wounds of the head. Wilkins RH, Rengachary SS, eds. Neurosurgery. New York, NY: McGraw Hill; 1996. Vol 2: 2813-2820. Rosenwasser RH, Andrews DW, Jimenez DF. Penetrating craniocerebral trauma. Surg Clin North Am. 1991 Apr. 71(2):305-16. [Medline]. Rosselli D. [Phineas Gage, 'Tan' and the importance of case reports]. Rev Neurol. 2005 Jan 16-31. 40(2):122-4. [Medline]. Salar G, Costella GB, Mottaran R, Mattana M, Gazzola L, Munari M. Multiple craniocerebral injuries from penetrating nails. Case illustration. J Neurosurg. 2004 May. 100(5):963. [Medline]. Salazar AM, Aarabi B, Levi L. Postraumatic epilepsy following craniocerebral missile wounds in recent armed conflicts. Aarabi B, Kaufman HH, Dagi TF, George ED, Levy ML, eds. Missile Wounds of the Head and Neck. Park Ridge, Ill: American Association of Neurological Surgeons; 1999. Vol 2: 281-292. Schulz C, Woerner U, Luelsdorf P. Image-guided neurosurgery for secondary operative removal of projectiles after missile injury of the brain. Surg Neurol. 2008 Apr. 69(4):364-8; discussion 368. [Medline]. Sinha P, Conrad GR, Williams BL. Visualization of bullet track and bullet by radionuclide brain scintigraphy. Clin Nucl Med. 2005 Apr. 30(4):249-52. [Medline]. Sosin DM, Sniezek JE, Waxweiler RJ. Trends in death associated with traumatic brain injury, 1979 through 1992. Success and failure. JAMA. 1995 Jun 14. 273(22):1778-80. [Medline]. Stack BC Jr, Farrior JB. Missile injuries to the temporal bone. South Med J. 1995 Jan. 88(1):72-8. [Medline]. Steinsvag S. [Penetrating injuries in the head and neck region]. Tidsskr Nor Laegeforen. 2005 Sep 8. 125(17):2369. [Medline]. Stiernberg CM, Jahrsdoerfer RA, Gillenwater A, Joe SA, Alcalen SV. Gunshot wounds to the head and neck. Arch Otolaryngol Head Neck Surg. 1992 Jun. 118(6):592-7. [Medline]. Torner JC, Choi S, Barnes TY. Epidemiology of head injuries. Marion DW, ed. Traumatic Brain Injury. New York, NY: Thieme; 1999. 9-25. Trask TW, Narayan RK. Civilian Penetrating Head Injury. Narayan R, Wilberger J, Povlishock, J, eds. Neurotrauma. New York, NY: McGraw Hill; 1996. 868-889. Tsuei YS, Sun MH, Lee HD, et al. Civilian gunshot wounds to the brain. J Chin Med Assoc. 2005 Mar. 68(3):126-30. [Medline]. Tudor M, Tudor L, Tudor KI. Complications of missile craniocerebral injuries during the Croatian Homeland War. Mil Med. 2005 May. 170(5):422-6. [Medline]. Verweij BH, Muizelaar JP, Vinas FC. Hyperacute measurement of intracranial pressure, cerebral perfusion pressure, jugular venous oxygen saturation, and laser Doppler flowmetry, before and during removal of traumatic acute subdural hematoma. J Neurosurg. 2001 Oct. 95(4):569-72. [Medline]. Verweij BH, Muizelaar JP, Vinas FC, Peterson PL, Xiong Y, Lee CP. Mitochondrial dysfunction after experimental and human brain injury and its possible reversal with a selective N-type calcium channel antagonist (SNX-111). Neurol Res. 1997 Jun. 19(3):334-9. [Medline]. Vetter H, Kolloch R, Appenheimer M, et al. [Effect of a chronic alpha adrenergic receptor blockade on basal secretion of renin in essential hypertension]. Schweiz Med Wochenschr. 1978 Dec 9. 108(49):1978-81. [Medline]. Vinas FC. Bedside invasive monitoring techniques in severe brain-injured patients. Neurol Res. 2001 Mar-Apr. 23(2-3):157-66. [Medline]. Vinas FC. Clinical Uses of Laser Doppler in the Intensive care Unit. Critical Reviews in Neurosurgery. 1999. 9:28-33. Vinas FC, Fandino R, Dujovny M, Chavez V. Microsurgical anatomy of the supratentorial arachnoidal trabecular membranes and cisterns. Neurol Res. 1994 Dec. 16(6):417-24. [Medline]. Vinas FC, Verweij B, Muizelaar P. Invasive monitoring of cerebral oxygenation. Critical Reviews in Neurosurgery. 1998. 8:31-40. Vinas FJ, Dujovny M, Barrionuevo PJ. [The craniocerebral injury. Experience on 3,443 cases in the police health department]. Rev Fac Cienc Med Cordoba. 1966 Oct-Dec. 24(4):441-57. [Medline]. Viñas FC, Ferris D, Kupsky WJ, Dujovny M. Evaluation of expanded polytetrafluoroethylene (ePTFE) versus polydioxanone (PDS) for the repair of dura mater defects. Neurol Res. 1999 Apr. 21(3):262-8. [Medline]. Wald SL. Advances in the early management of patients with head injury. Surg Clin North Am. 1995 Apr. 75(2):225-42. [Medline]. Waxweiler RJ, Thurman D, Sniezek J, Sosin D, O'Neil J. Monitoring the impact of traumatic brain injury: a review and update. J Neurotrauma. 1995 Aug. 12(4):509-16. [Medline]. Weigelt JA. Resuscitation and initial management. Crit Care Clin. 1993 Oct. 9(4):657-71. [Medline]. West CG. A short history of the management of penetrating missile injuries of the head. Surg Neurol. 1981 Aug. 16(2):145-9. [Medline]. Winder MJ, Monteith SJ, Lightfoot N, Mee E. Penetrating head injury from nailguns: a case series from New Zealand. J Clin Neurosci. 2008 Jan. 15(1):18-25. [Medline]. Yorks ML. More on Phineas Gage. N Engl J Med. 2005 Mar 3. 352(9):944; author reply 944. [Medline]. Zhang J, Yoganandan N, Pintar FA, Gennarelli TA. Temporal cavity and pressure distribution in a brain simulant following ballistic penetration. J Neurotrauma. 2005 Nov. 22(11):1335-47. [Medline]. 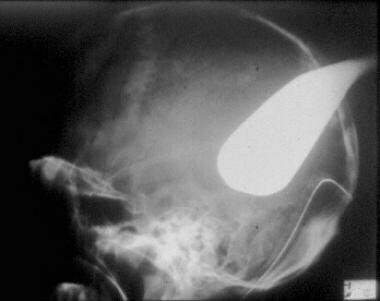 Lateral skull radiograph of a young female who presented to the emergency department with a stab wound to the head produced by a large knife. Intraoperative view of a middle-aged male with an open depressed skull fracture. Intraoperative view the surgical reconstruction repair of a complex skull fracture. A 57-year-old male who suffered a motorcycle accident. He was not wearing a helmet. He suffered a severe abrasion with tissue loss through skin, temporalis muscle, temporal bone, and dura. 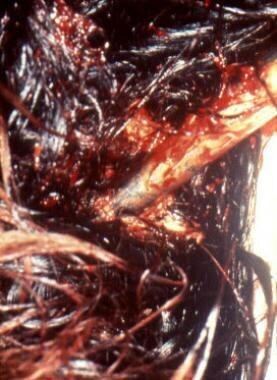 Note brain tissue exposed through his wound. He was taken urgently to surgery for debridement and reconstruction using a rotational flap.